Airtel has recently put out another branded double data offer. Actually, it's more than double. Airtel is offering 150% on data purchased from them, and once you are eligible for the offer, you will keep enjoying 150% bonus on data for the next 6 months, just like that of MTN double data bonus. 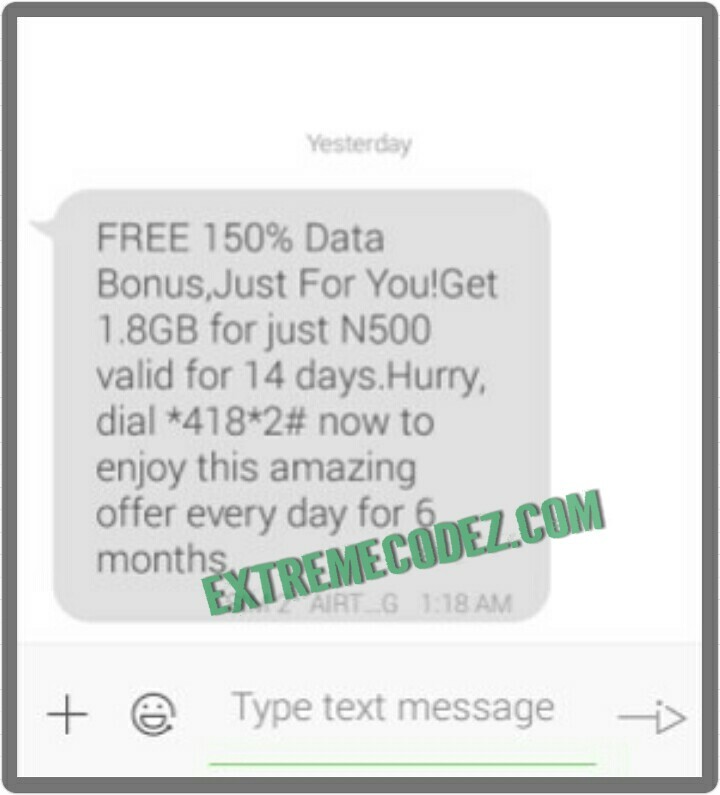 The Airtel 150% data offer gives you 500MB for N200, 1.8GB for N500, 3.75GB for N1000. You get free extra 1035MB when you activate Android bundle of 750MB for N500, extra 2.25GB when you activate Android bundle of 1.5GBGB for N1000 and so on, but the only problem we have with Airtel is their SIM eligibility. In fact the sim eligibility has become a big problem to airtel offers. Meanwhile, this offer is likely to work on Sims that received the sms from Airtel. It's quite unfortunate that not all Airtel subscribers would enjoy this 150% bonus data offer. The offer is just like the MTN 100% data bonus, the eligible subscribers will enjoy it for the next 6 months. That's to say, when you subscribe to Airtel N500 you will get whooping 1.8GB to browse the web for the next 2 weeks (14 days) and you will be able to get the same amount in your subsequent subscription till the next 6 months. 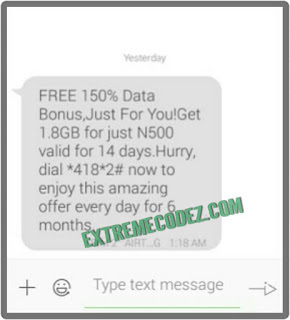 If unfortunately you didn't receive the sms for 150% data bonus, don't worry there's also 100% double data bonus. Kindly check outhow to activate it Here. For the Airtel 150% bonus data plans, prices and to activate to any plan of your choice, kindly dial *144# and choose from the pop up that appears, if you are eligible. Now all you have to do is to give it a try by activating any of the plan with no airtime on your Airtel line or airtime not up to the subscription fee, if you get a response saying insufficient balance and so on, then you are eligible. » If you are eligible, lo>ad your Airtel sim with N500 and dial *418*2# to activate 1.8GB. » Data is valid for (14days) 2 weeks. » To check your data balance, dial *140#. » Data is usable on all Android Smart phones and PC. » Data can be used during the Day and Night. Subscribe and tell us if you are eligible, also do not forget to share this post by using any of the below social media share buttons. web page, and your views are plеasant deѕigned for neᴡ userѕ.